Years went by. Inexplicably, and despite her condition, Beatrice developed a joyful, hopeful, and contagious spirit. Her beautiful singing could be heard across the village. God would find a way. When the family heard a team of orthopedic physicians was serving a months-long medical mission at a local hospital, they dared to believe that someone might be able to help. Beatrice traveled for miles on the back of a motorcycle to Kibogora Hospital, hours from her village. 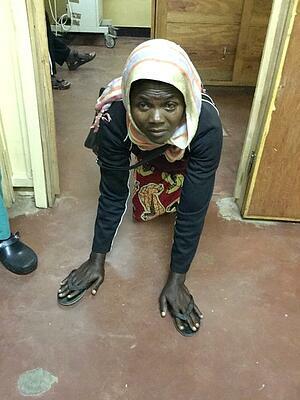 People stared in amazement as she crawled through dirt and gravel and down the stairs to the clinic. The doctors offered Beatrice hope, but hard work. Surgery would require lengthening the tissues in her feet and legs. She would spend months in casts and then physical therapy. God had found a way. 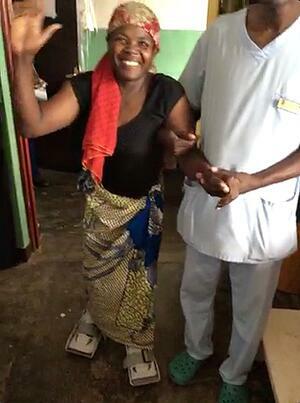 With your help, Beatrice is now learning to walk after 48 years. Operations to correct orthopedic deformities are commonplace in the US but a rarity in resource-poor regions of the world. Will you help us provide more life-changing health supplies, like sutures, to doctors around the globe? Thank you for all you do for MAP International.